I have often tried to explain that my music is a reaction against the romantic and expressionistic musical past, and that I am seeking something more objective, something that doesn't express my emotions, something that doesn't try to manipulate the emotions of the listener either, something outside myself. Sometimes I explain that my reasons for being a minimalist, for wanting to work with a minimum of musical materials, is because it also helps me to minimize arbitrary self-expression. Sometimes I say "I want to find the music, not to compose it." Sometimes I talk about mathematics and formulas, and how these things provide a means of avoiding subjective decisions and permitting objective logical deductions. Sometimes I quote my teacher Morton Feldman who said so often "Let the music do what it wants to do. Sometimes I draw a parallel with the way John Cage used chance, which was also an attempt to base his music on something outside of himself. Sometimes I talk about all these things, and think that surely everyone will understand what I am doing and why I am doing it, but whatever I say there are questions: What am I supposed to feel? How can music be impersonal like that? Don't you want to express something? Won't this just produce a cold meaningless music? etc. etc. The idea of music as self-expression is so ingrained in the music education of almost everyone that people become totally disoriented when you try to take it away. Then one day, frustrated by my inability to communicate my esthetic goals to a group of students, I just said "I am not interested in autobiography." This was the keyword, and suddenly everyone seemed to understand. I think the reason my point of view was easier to understand when I said I wasn't interested in "autobiography" is because this word comes from literature, where it applies only to a small and relatively unimportant category. In literature it is clear that autobiography is subjective rather than objective, and that most of the time good literature involves characters that have an existence outside the writer's own life. This clearly implies that music too should be better when it is not centered around the composer's own subjective feelings. Of course, the kind of objectivity I'm striving for goes quite a bit further than simply avoiding autobiography, but observing this parallel was helpful to the people who were trying to understand my music that day, and thinking about it later has helped me, so I thought it might also be useful to try to explain this in a written essay, even though it will require some autobiographical reflection in order to do so. As I started to write about wanting to avoid autobiography in my own music, I realized that I have been using two other words lately to describe my music and how I make it, and it will be good to talk about these other two keywords as well: "truth" and "interpretation. "Truth" is a lofty idea, and it is certainly not good for artists to think of themselves as distributors of truth. The term is meaningful for me, however, because I find it much less lofty and much more useful than the term "beauty," which is the one usually used to describe what artists attempt to distribute. I am not against beauty, of course, but I don't really know what it is or how to deal with it. "Beauty" seems to apply to all the best artistic products in all the centuries, things that are somehow attractive and agreeable, and that somehow have wonderful esthetic properties. But such things are very difficult to explain, while truth, on the other hand, is much clearer. Something is true if it correlates to what one can observe in the real world, if it follows its particular logic, if we can somehow demonstrate that it is coherent and correct. Of course, true and false are often only relative, but often things are absolutely true, beyond any doubt, and sometimes there even seems to be a connection between truth and beauty. I would not say that the truth is always beautiful, but things are certainly not beautiful when they are untrue, as when musicians play wrong notes, or leave out a measure in the music, or insert an incorrect 5/4 measure in what is supposed to be 4/4 music. Composers, as well as interpreters, can miscalculate time proportions, or make bad judgements in orchestration, or leave inconsistencies that confuse the music, and make other sorts of mistakes, and a good music theorist or composition teacher can easily find such errors. In such cases no one seriously questions that the correct or true version is better than the incorrect or untrue one. Mistakes are not beautiful, and they are not inexplicable either. In the case of my own music, this quest for the correct, the true, is particularly important. When I wrote Tango and Music and Questions, both of which consist of 120 permutations of sequences of five notes, I had to try many different sequences before I knew how I wanted the music to proceed, but there was no question of writing more or less than 120 phrases. Usually in such a piece one can also hear the logic. The truth becomes audible, which means that if a performer plays the same permutation two times in a row, or disturbs the six-bar phrases with a phrase of only five bars, the listener will probably hear that something is wrong, something is untrue. Of course, for this to happen, the music must be relatively simple, clear, transparent, which explains once again my preference for minimal materials. Naturally there is a disadvantage in seeking this kind of perfection, because performers are rarely perfect. There is usually some unfortunate moment, some mistake, some untruth that is quite audible in my transparent music, and that makes the performance somehow unsatisfying, regardless of tonal richness, speed, virtuosity, excitement, intensity and whatever other positive qualities may be present. Of course there is also an advantage, because occasionally, when a good performer is concentrating very well, one can hear a performance without a single mistake, a pure audible truth, and that is extremely satisfying. The third key word is "interpretation," but to explain that I must go back to truth, and then back even further to the source of truth. Where do permutations come from? Who decided that five elements can be permuted in 120 ways? Well, I believe that such things are given, that they would be the same on another planet or for another species. Such things existed before humans were on earth, and they have merely been discovered by us, not invented. We have to be careful here, because mathematical things are abstract, and sometimes one can argue that they really are human inventions rather than discoveries. We know that a line, for example, is "the shortest distance between two points," but we also know that this is only a theorem of Euclid. It is very hard, if not impossible, to find visible lines in nature, or even to show that sounds and x-rays move in straight lines. We have no physical, empirical evidence for lines, and this can also be said of circles and triangles and geometry in general. We like this Euclidian way of explaining things, however, and it enables us to calculate hypotenuses and circumferences and lots of other things that are directly applicable to the physical natural world, the so-called "real" world, which platonic thinkers continue to find less real than the line and the hypotenuse. I believe that many musical phenomena also have absolute existence, and were not simply invented by musicians, and the 8178 chords possible in one octave, as stated in my Chord Catalogue, is a case in point. Inversions and retrogrades seem to me to be additional examples of musical absolutes. It was not necessary to wait for a composer of genius in order to realize that one can turn something upside down, or backwards, or both. Mirror relationships and symmetries can be observed all over in nature, as well as in all sorts of music and visual art in all sorts of cultures. Somewhat more rare, but equally obvious and absolute are additive procedures, where one note becomes a melody of two notes, then three, then four, etc. That too is something that has been discovered in many situations by many people, but one wouldn't say that anyone had really invented it. More sophisticated phenomena like prime numbers, Pascal's triangle, and the Fibonacci series can probably not be discovered by someone who is not already rather advanced in arithmetic and geometry, but eventually people in quite a few cultures have discovered them, and eventually even musicians find ways of applying such things. Self-similar structures, formulas, automata, and other techniques have entered the musical language only recently, because these are even less obvious, but I don't think we can claim to have invented any of these things. It was just a matter of time until somebody, or rather lots of people, found them. Now that I have explained that most of what I am using when I write one of my mathematical pieces is things like combinations and formulas and symmetries, things we have simply discovered rather than invented, I can get back to the third keyword, "interpretation," and explain that my idea of composing is not so much composing new things, but simply interpreting things that already exist elsewhere. If you are simply discovering something already present in nature, you are just interpreting nature. For example, the Indian mathematician Narayana came up with a curious infinite sequence in the 14th century. It is something like the better known Fibonacci sequence, and has curious properties, which I made use of when I wrote Narayana's Cows six centuries later. I was not composing a piece in any usual sense, though, but rather doing a musical interpretation of Narayana's interpretation of this phenomenon. I left this score simply as three lines of music, because it didn't seem right to lock the music into one specific instrumentation. I preferred to let this interpretation process go on, to allow Ulgly Culture, MusikFabrik, percussion ensembles, saxophone groups, orchestras, and any other kinds of ensembles all do their own interpretations. It is important to note that if Narayana hadn't found this series (which begins 1 2 3 4 6 9 13 19 28 41...), someone else would have, and the process continues today. Recently Jean-Paul Allouche demonstrated how the Narayana series and the Fibonacci series are related to one another, and to other series. As explained in our joint article, "Narayana's Cows and Delayed Morphisms," there is a whole category of sequences that can be constructed by simply delaying the generation process, and all of these probably have applications somewhere in the physical world, and other mathematicians and musicians and artists and architects and biologists may want to interpret these in their own ways, and of course, there may be interpretations of these interpretations, and new related discoveries, and interpretations of these, and the process can go on and on. But no one will ever really create anything new, because at least in my opinion, those numbers and possibilities were always there, just waiting to be discovered and interpreted. By now, I think it should be clear that if a composer can be content to simply interpret and discover things, istead of creating, and can focus on truth instead of beauty, then the result should be objective instead of subjective, and autobiographical music can be avoided, and at least a few people like myself will be happy with the result. Of course, it is also clear that I have been totally subjective in this present text, which speaks exclusively of my music and my personal experiences. But then, I didn't say that I wanted to avoid autobiography in every piece, or in every aspect of my life. Tom Johnson, born in Colorado in 1939, received B.A. and M.Mus. degrees from Yale University and also studied composition privately with Morton Feldman. He is considered a minimalist, since he works with simple forms, limited scales, and generally reduced materials, but he proceeds in a more logical way than most minimalists, often using formulas, permutations, and predictable sequences. Johnson is well known for his operas: The Four Note Opera (1972) continues to be presented in many countries. Riemannoper has been staged 20 times since its premier in Bremen in 1988. The latest, Trigonometry, was premiered in Hamburg in November 1997. Non-operatic works include the Rational Melodies, Music for 88__, and the __ten-played Failing: a very difficult piece for solo string bass. 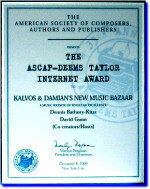 A theoretical book devoted to Self-Similar Melodies was published in 1996 by Editions 75, where all of his scores are also available. His largest composition is the Bonhoeffer Oratorium, a two-hour work in German for orchestra, chorus and soloists, with text by the German theologian Dietrich Bonhoeffer. The oratorio was premiered in Maastricht in September 1996 and received its German premier in Berlin in November 1998. After 15 years in New York, he moved to Paris, where he has lived since 1983. His wife is the Spanish artist Esther Ferrer.